They were an extra, my laser has them, but they are extremely rare and finding parts to fit a system will be difficult and expensive. If Martin or none of the other traders don't have any, You can get the washers as NOS very occasionally on Ebay but be prepared to fork out around £200 a pair. Then you will need the large capacity washer bottle with 2 pumps, one for the screen, one for the washers. They are also wired so that the headlamp washers work only when the headlights are on, they work in tandem with the screen washers, not sure what's involved in that bit as they were factory fit on my MK3 Ghia. To wire up the headlight washers so they only work when the headlights are on and the windscreen washers are operated, you need to wire up a standard 4 pin relay. 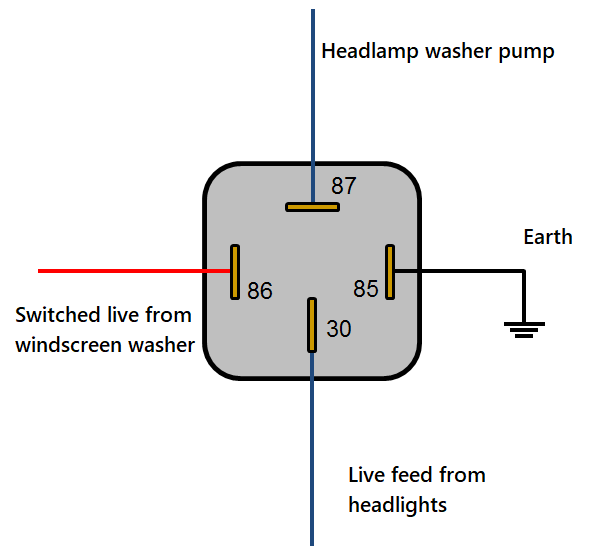 Instead of using a permanent live for pin 30, use a feed that is only live when the headlights are on. Ideally, this feed should have an in-line fuse of a suitable rating. Edit: There is a spare spade connector on the bottom of the headlight relay. That's most likely to provide the live feed to pin 30 of the relay in my diagram above. Last edited by Andrew 2.8i on Sat Dec 08, 2018 9:38 am, edited 1 time in total.